For something that plays such an important role in our lives, Wi-Fi is rubbish. We’re often plagued with black spots, slow speeds, unstable connections, and worst of all, ugly routers. In an age where literally everything, even mirrors and toasters, require an internet connection, having a rock solid connection is more important than ever. You may have noticed a recent rise in ‘tri-band mesh networks’, which consist of a Hub and Satellite, both blasting signal into every corner of your house. There are many imposters, but NetGear Orbi is the original, and we’ve been using it for several months to see if it’s any good. NetGear Orbi is a Wi-Fi router. It consists of a hub and satellite (or multiple satellites), which create a tri-band mesh network around your home. The satellite is similar to a Wi-Fi range extender, boosting the signal in hard to reach places, but with a few major benefits. Plug the Orbi hub into your broadband, and place the satellite somewhere else (ideally near the centre of your home) to extend the coverage. The hub and satellite are essentially connected via a virtual wire, using a dedicated frequency (1,733Mbits/sec, 802.11ac 5GHz network) to communicate between them, while pumping out 866Mbits/sec 802.11ac 5GHz and 400Mbits/sec 2.4GHz just for your devices. You can’t choose which frequency you connect to, instead Orbi uses band steering, which will automatically connect you to the best network depending on potential speed, network load and network strength. One thing worth noting is that more affordable rivals don’t use a dedicated frequency. Instead, they use 5GHz for communicating between the hub and satellite, and only output 2.4GHz for your devices. Yes, very good. The system was incredibly easy to set up, and it’s been rock solid ever since. There’s even great performance when several devices are using data at once thanks to MU-MIMO. The benefits over traditional range extenders are clear. By using a dedicated wireless channel between the Orbi hub and each satellite, there’s no speed deterioration, and there’s only one network throughout the house (rather than creating a separate network in addition to your router’s). To test the range extending capabilities we did several speed tests in the garden (around 50 metres from the hub), several with the satellite turned off, and others with it turned on. Turned off we got average speeds of around 20-50Mbits/sec, but when turned on we got speeds of +150Mbits/sec. We also think Orbi looks great (as far as Wi-Fi routers go), although, a little on the portly side. It resembles a vase or Glade electric air freshener, rather than a traditional Wi-Fi router. And one final benefit is that the Orbi hub and satellite feature four ethernet ports each. I found this incredibly useful as I usually have multiple smart home hubs plugged in at one time (Sonos, Samsung Smart Things, Philips Hue, Yale, Netgear Arlo). You can buy NetGear Orbi most places including Currys and Amazon. It’s pretty expensive, at £350. Is it worth £350? 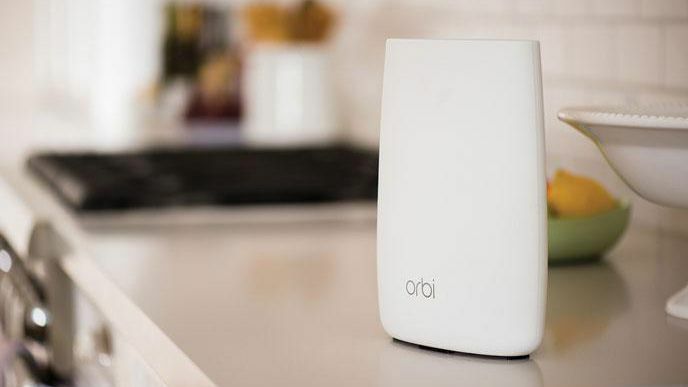 It depends whether you'd really see the benefit of Orbi over a high-end traditional router - you'd need to take house size and wall thickness into consideration.